Fiona, thanks for having me on your blog to chat about my current whereabouts. Life’s been pretty exciting recently for us as we’ve moved from a house to a catamaran called Roo Bin Esque. My husband’s taken to calling us Grotty Yachties… Nothing grotty about this sailor! Probably the best part of that move (and downsizing was the hard part) was the journey north from Brisbane to Cairns. I knew the coastline was amazing as I fly over it regularly with my day job but I was blown away. We live in an amazing country. 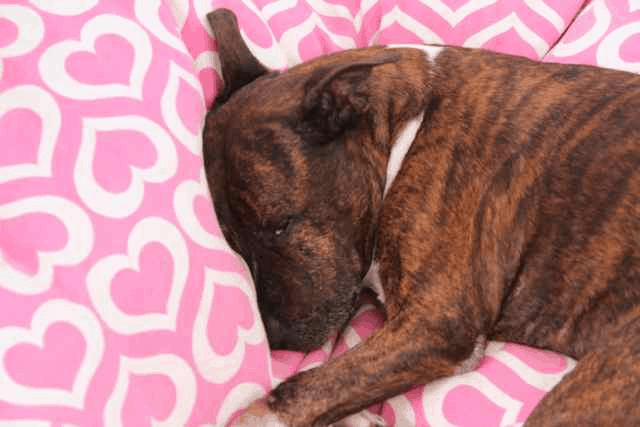 I thought I’d share some of photos of our new life afloat – including Zeus’s take on the world! 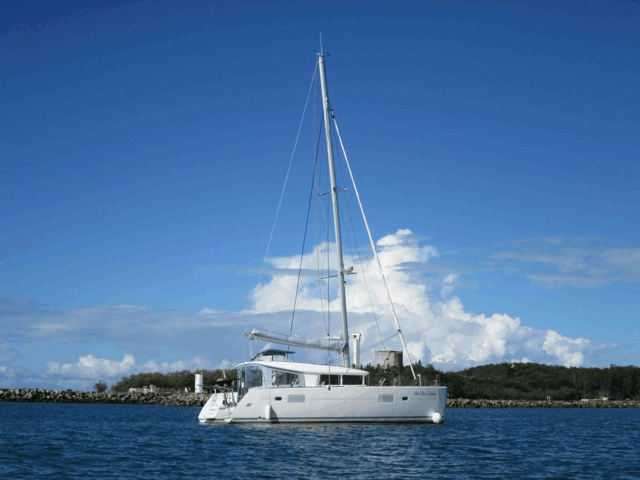 Roo Bin Esque is a Lagoon 400 Catamaran, which means she’s a 40 ft boat with three bedrooms, two bathrooms and a dinghy out the back – a bit like a tiny modern apartment! Here she is anchored of Mooloolaba. 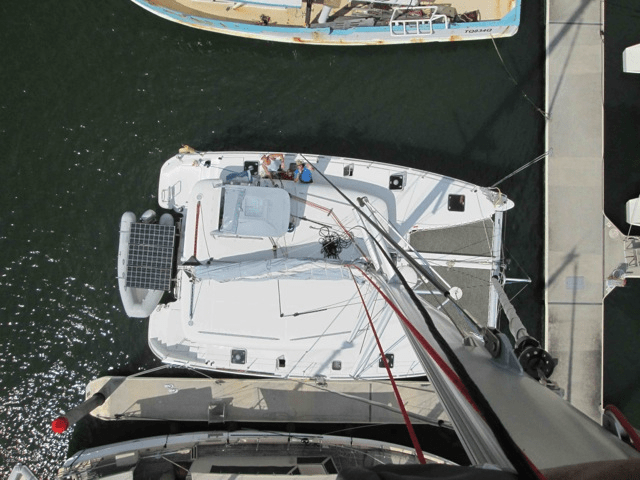 Probably the best view from the boat is from the top of the mast. While I don’t plan on doing that on a regular basis I did have to go aloft twice just after we bought the boat to fix damaged rope on the mainsail. It was exhilarating and a little unnerving dangling on a rope 25 metres above the water!! I’ve always been a lover of sunset and sunrises and one of the beautiful things about the journey north was having the time to enjoy them every single day. I drove Capt G mad taking photos, but here are my two favourite shots from the trip. 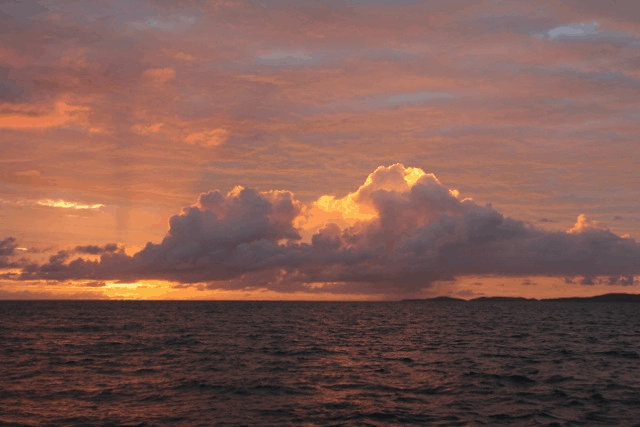 The first one is sunrise at the Percy Islands. What do you think? I had a hard time choosing the sunset, but I’ve gone with the one over Cape Grafton mainly because it was a day filled with mixed emotion. It was almost the end of the journey. I was excited that home was just around the corner and we’d had a safe and successful journey, but I was also a little sad that our adventure was coming to an end. 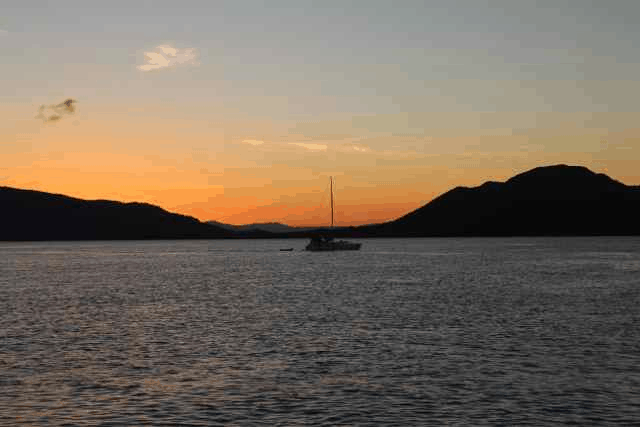 It’s an ever-changing community as boats come and go heading off on new adventures. One day we’ll join them, but for now Roo Bin Esque is bobbing at her mooring and Zeus, the salty sea dog, is doing what he does best in his retirement – sleeping! You can find the crew of Roo Bin Esque at http://www.heleneyoung.com. 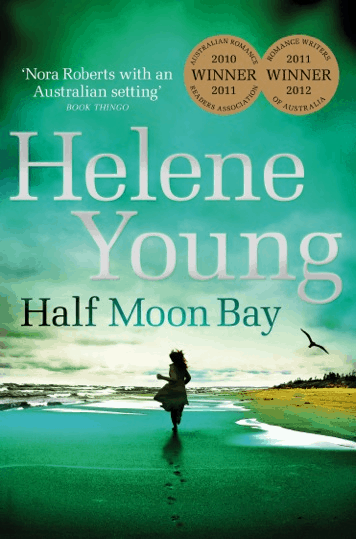 Multi-award winning author, Helene Young, lives aboard a catamaran moored near the Great Barrier Reef in the Coral Sea. 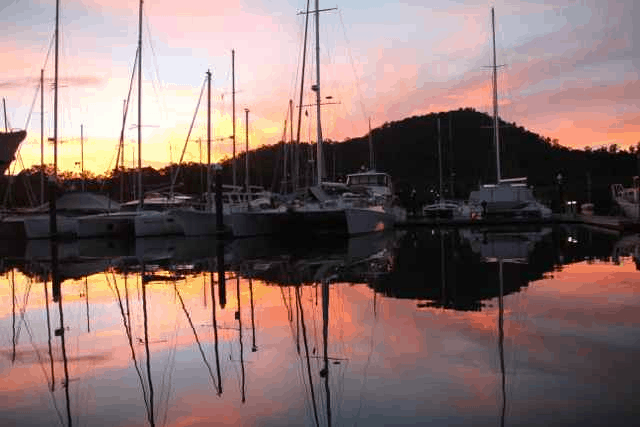 She shares her sailing adventures with her husband and their dog, Zeus. 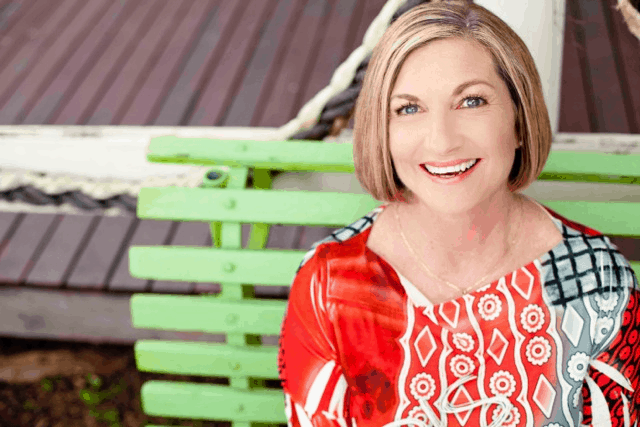 Her work as a senior captain with a major regional airline takes her all over Australia and she draws inspiration for her stories from the communities she visits. She won the Romance Writers of Australia (RWA) Romantic Book of the Year Award in 2011 and 2012. She was also voted most popular romantic suspense author by the Romance Readers of Australia (ARRA) in 2010 and 2011, and shortlisted for the same award in 2012. Helene is also the custodian of several thousand bees and in what spare time she has left, loves to read and travel.